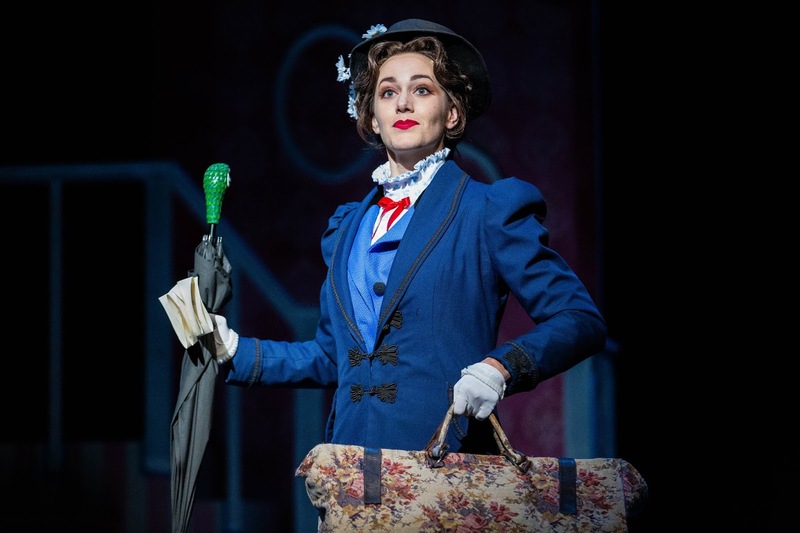 Artistry's Mary Poppins may be just the thing you need right now. That is, an escape from reality into the magical world of everyone's favorite nanny, filled with talking dogs, moving statues, high-flying kites, and fantastic dance numbers. Watching the show is, indeed, a jolly holiday as Artistry's large and talented cast brings the beloved movie to life with unstoppable energy. This is my third time seeing the 2004 stage adaptation of the 1964 classic movie and P.L. Travers' series of books, with book by Julian Fellowes (creator of Downton Abbey) and about a half dozen new songs added. I still think it's a bit long and bloated, with several scenes, songs, and characters that could be cut to make the runtime more child (and me) friendly than the current nearly 3 hours (which of course is no fault of Artistry, they have to work with the piece as written). But on the whole it's a heart-warming and smile-inducing show filled with moments of magic and delight for any age. Everyone knows the story of the stern but fair nanny who appears out of the sky to care for Jane and Michael Banks. She teaches the children manners, feeds them their medicine (with a spoonful of sugar), and brings some much needed play into their lives. A walk through the park turns into a technicolor dream, with Bert the chimney sweep adding to the fun. They visit a "talking shop" and learn about the most splendid word, and have an adventure on the rooftops of London with the chimney sweeps. In the play Mary leaves and then comes back again, which allows for the appearance of Mr. Banks' terrible and terrifying nanny Miss Andrew, which makes everyone appreciate Mary more. Mr. Banks has work troubles, and Mrs. Banks feels neglected. 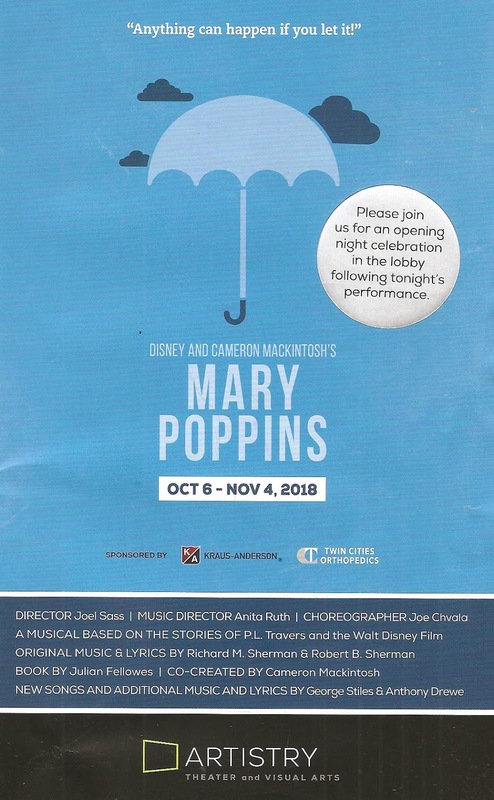 Mary not only helps the children, but also helps to turn Mr. Banks from an insufferable embodiment of the patriarchy into a caring father and husband (there are a few people in today's world that I wish Mary Poppins would pay a visit to and whip into shape). And when the family is repaired and she is no longer needed, Mary Poppins flies away again, to return when and where she's needed (e.g., the much anticipated Emily Blunt/Lin-Manuel Miranda movie sequel this December). Joel Sass directs and also designed the set, as he does. Through both jobs he's created a magical and vibrant world. Colorful set pieces roll in from the sides or overhead, against a backdrop of the city silhouette, while a rolling ladder is used to represent Mary flying in on her umbrella. The huge cast of two dozen or so fills the space but doesn't crowd it, and moves like a dream to Joe Chvala's choreography. Who, by the way, is the perfect person to choreograph a number like "Step in Time" with his trademark percussive choreography (if you don't know what that is, you will when you see this show). 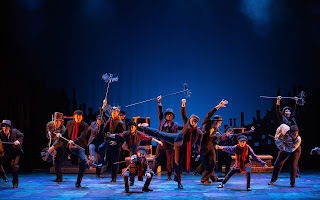 In this highlight number (which alone is worth the price of admission) and other numbers, the ensemble is stomping, tapping, clapping, and slapping in time with the music to create a feast for the eyes and ears. "Supercalifragilisticexpialodocious" is also a highlight as the cast spells and signs the letters with ever increasing speed. I wish I could watch those two numbers every day. Joe Chvala's choreography, as realized by this talented ensemble, is truly a thrill to witness. 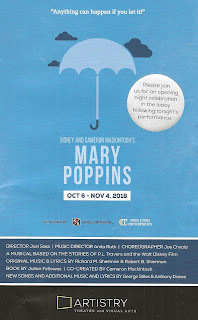 This is in many ways an ensemble show, but it doesn't work without a strong Mary Poppins. We have that here in Becca Hart, who I've previously predicted is going to be a star (or perhaps already is). If you'll pardon the obvious reference, she is practically perfect in every way: a gorgeous soprano voice, and just the right prim and proper yet playful attitude. She's well matched in the charming C. Ryan Shipley as the affable chimney sweep Bert. Other highlights in the cast include Charlie Clark and Andrea Wollenberg as Mr. and Mrs. Banks, Caitlin Burns and Christian B. LaBissioniere as the entertaining servants, a short but memorable appearance by the always fabulous Brandon A. Jackson as Miss Andrew, and of course the children - Mabel Weismann and Liam Beck-O'Sullivan on the night I saw the show (alternating with Kate Regan and Josh Bagley, who appear in the photos on this page). I can't end an Artistry post without mentioning resident Music Director Anita Ruth and her 13-piece pit orchestra. It's rare to see a full pit orchestra for a local production of a musical, and as a proud former band geek it's always a thrill. 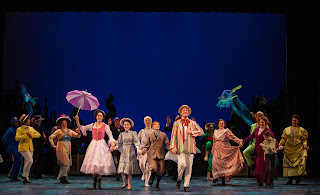 Most of your favorite songs from the movie are in the stage show, including "Jolly Holiday," "A Spoonful of Sugar," and the lovely and plaintive "Feed the Birds." And some of the new songs, notably "Practically Perfect" and "Anything Can Happen," might become your new favorites (although in addition to the positive message, the latter also makes me think - anything did happen, and we let it). But enough of that. 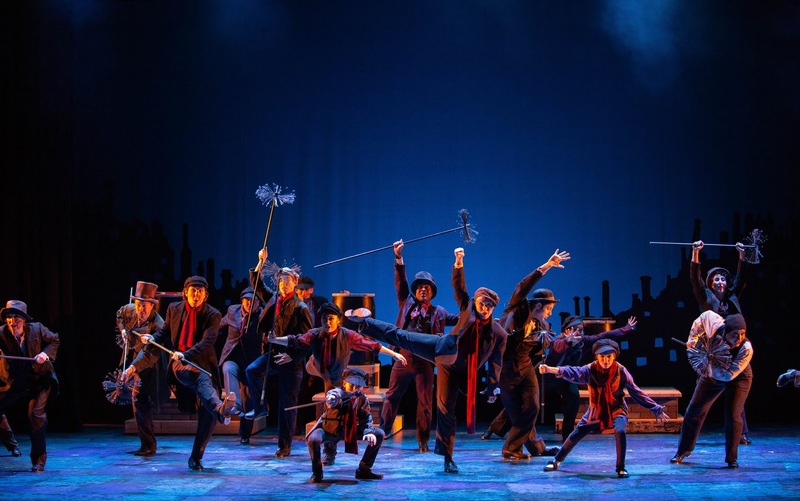 Artistry's Mary Poppins is a delightful feel-good musical that will bring back nostalgic feelings about the movie, and warm your heart with its message of family, community, and play. The show continues through November 4 but Artistry's big classic musicals tend to sell very well, so make your plans now if you'd like to experience the magic (click here for info and tickets).